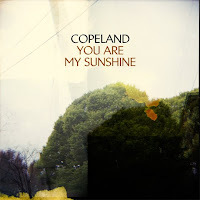 Atlas and the Anchor: Copeland - "You Are My Sunshine"
Copeland are set to release their fourth full-length, "You Are My Sunshine", October 14th on Tooth & Nail Records. Building on their last two releases, "In Motion" (2005) and "Eat, Sleep, Repeat" (2006), Aaron Marsh and company deliver more of their lush, introspective, and graceful indie rock. Although they have removed some of the emo-punk stylings of their past efforts, Aaron's voice is the spotlight again with his heartfelt, atmospheric delivery. Produced by both Aaron Marsh and the acclaimed, Aaron Sprinkle (Anberlin, Eisley). They have created a laid back, more organic and less polished sounding record that reflects the lullaby the album is named after. "Good Morning Fire Eater" burns with waves of synth and bending guitars over a loose beat with cooling vocals. "The Grey Man" is more piano driven with ringing guitars and soaring vocals. Both are great introductions to the new album and can be heard on their Myspace and Purevolume pages. Jenny Lewis - "Acid Tongue"